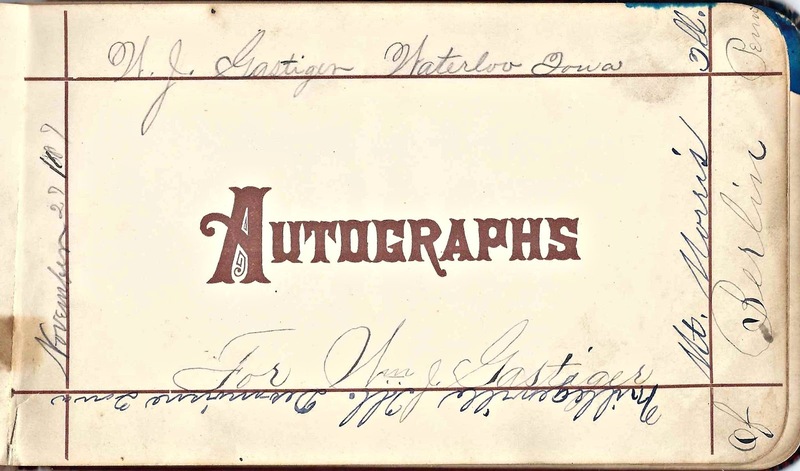 1880s autograph album of W. J. Gastiger, who, judging from the messages within the album, moved from Pennsylvania to Waterloo, Iowa, with perhaps a stop at Milledgeville, Illinois in between. 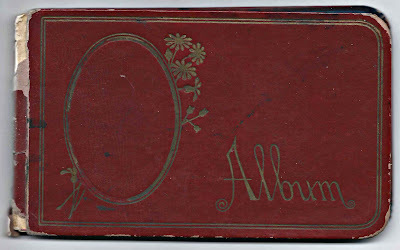 The album is approximately 7" x 4" and contains over 40 pages signed by the owner, his relatives and friends. An alphabetical list of the signers appears at the end of this post. 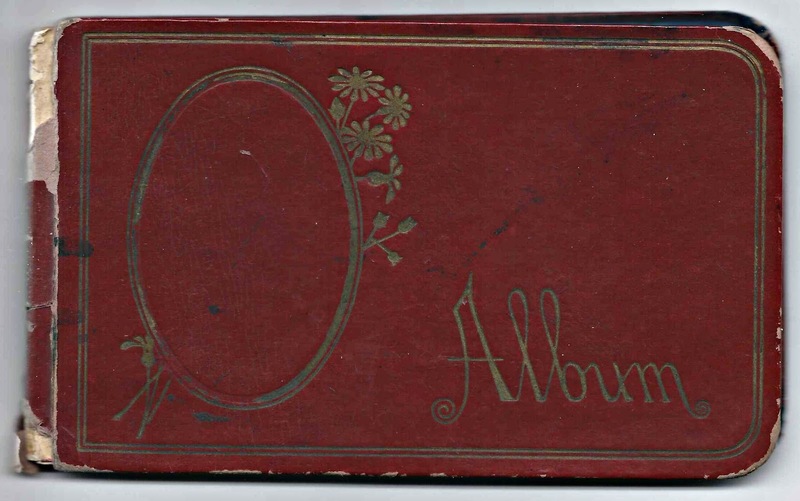 Because of the preponderance of surnames such as Blough and Fike, I believe that this may have been the album of William J. Gastiger, son of Joseph W. and Susan (Blough) Gastiger of Pennsylvania. The Blough and Fike families were inter-connected. William J. Gastiger was born about 1867, in Pennsylvania, though I also saw a reference to his birth as about 1858. There may have been two men of this name. If our William J. Gastiger was the son of Joseph W. and Susan (Blough) Gastiger, then he is the William who married Elizabeth M. Suder, daughter of Benjamin and Mariah (Sevits or Zavitz). They had a son Elwood Peter Gastiger, born 4 February 1898 in Somerset County, Pennsylvania. 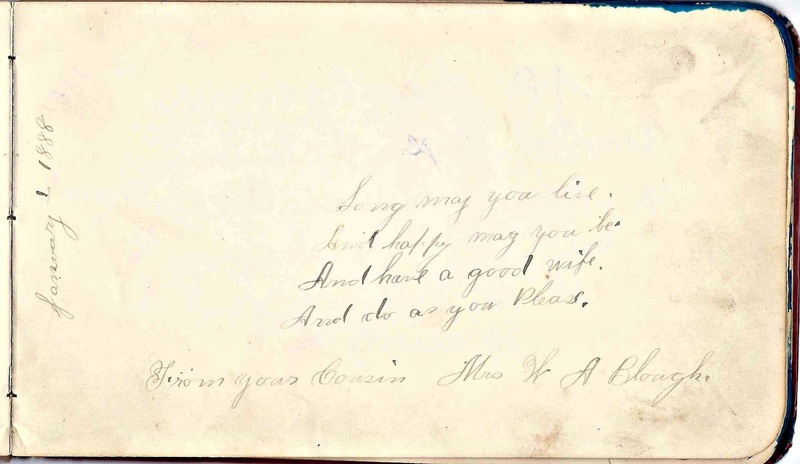 Hopefully, after reading the list of signers below, some of whom helpfully provided a family relationship to W. J. Gastiger, a reader with knowledge of the family will provide a clarification in the comments section or contact me directly. 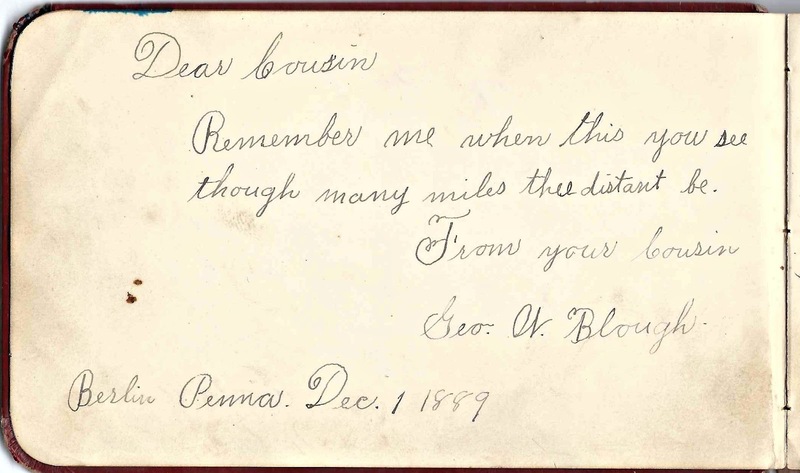 Cousin George W. Blough signed a page at Berlin, Pennsylvania, on 1 December 1889. 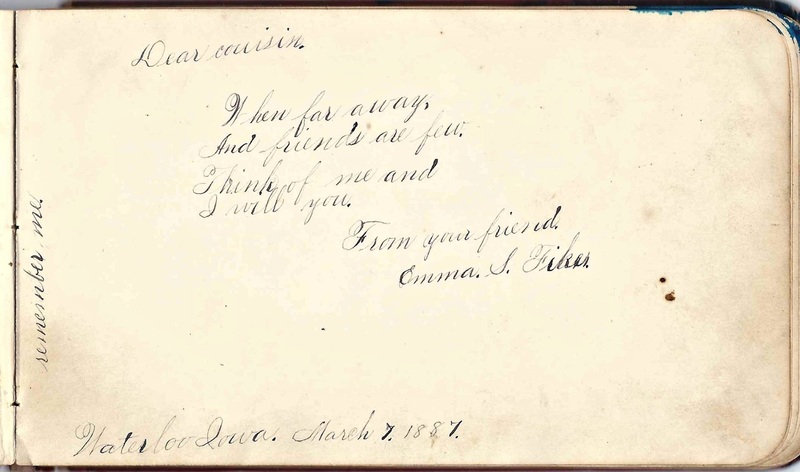 Cousin Emma S. Fike signed a page at Waterloo, Iowa, on 7 March 1887. 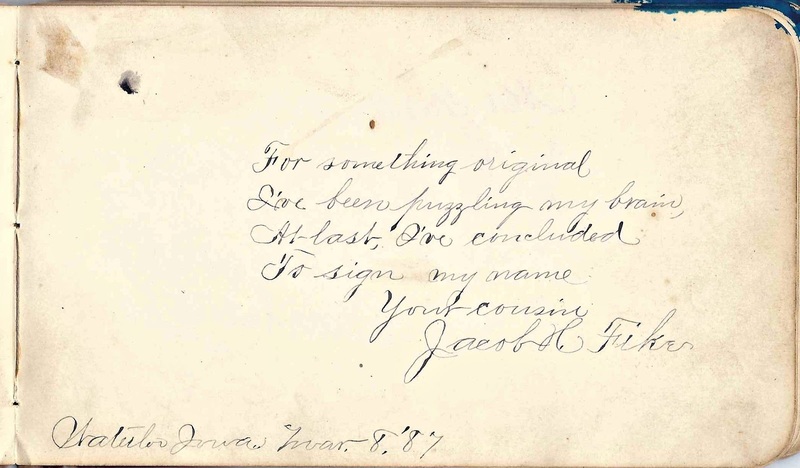 Cousin Jacob H. Fike signed a page at Waterloo, Iowa, on 8 March 1887. 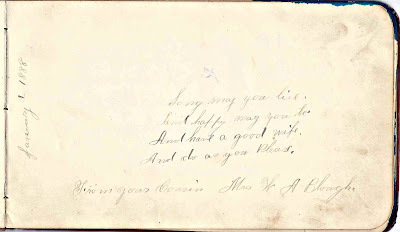 Cousin Mrs. W. A. Blough signed a page on 1 January 1888. In January 1888, William apparently stayed overnight at Mt. Morris College in Illinois, in the room of M. M. Fike of Milledgeville, Illinois, and H. I. Buckley of Mt. Morris, Illinois. They signed facing pages, with the word "Room" at the top of one and "Mates" at the top of the other. The album has an old photograph tucked inside. 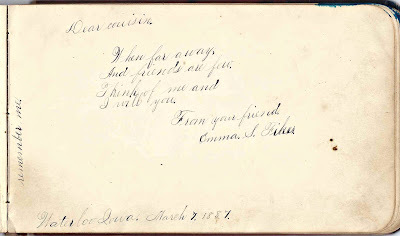 Though the pages it was tucked in may have no significance, they were the facing pages of Clara Stokes, who signed at Waterloo, Iowa, on 3 January 1888 and Ellen, who signed her name without much room to spare, so that her name appears to be Zim, but might be Zimmerman, which was the surname of the signers following her page. If you have information to share on William J. Gastiger or any of the signers, please leave a comment or contact me directly. Thanks! H. I. Buckley of Mt. 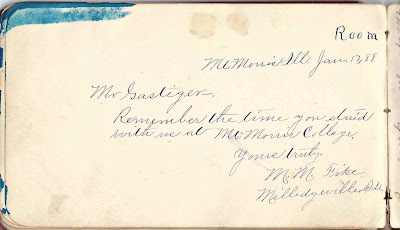 Morris, Illinois, signed 16 January 1888 at Mt. Morris College. 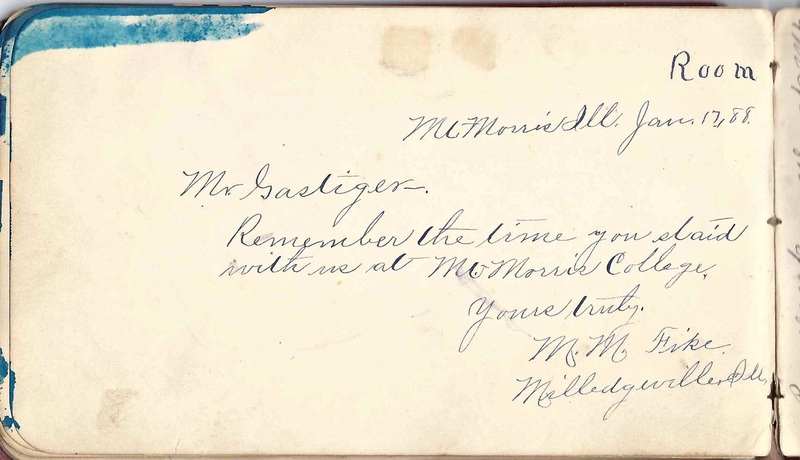 This page has the word "Mates" at the top; the preceding page, signed by M. M. Fike of Milledgeville, Illinois, has the word "Room", so these two signers were roommates at Mt. Morris College. 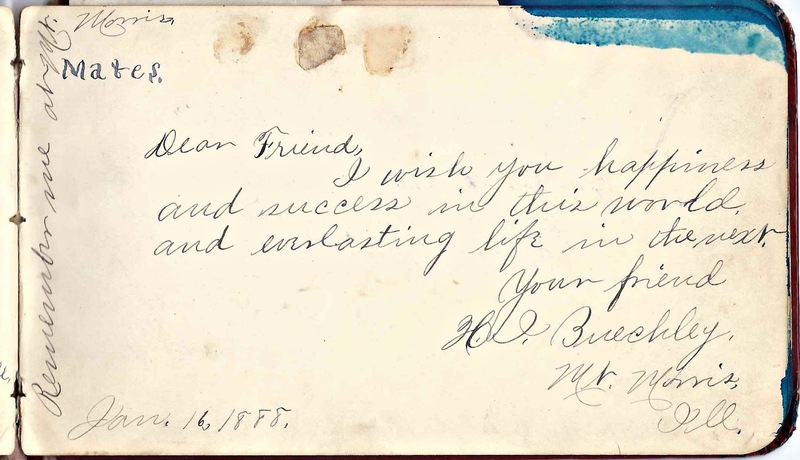 M. M. Fike of Milledgeville, Illinois, signed at Mt. Morris, Illinois on 17 January 1888. "Remember the time you staid with us at Mt. Morris College" - there is the word "Room" at the top of this page, and the next page has the word "Mates", so M. M. Fike and the next signer, H. I. Buckley of Mt. Morris, Illinois, were roommates at Mt. Morris College, in Illinois. 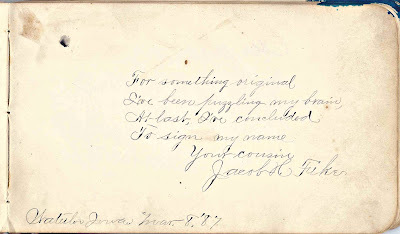 J. H. Furnoy of Berlin, Pennsylvania, signed 23 February 1890. Looks like Furnoy, but could be Forney, as there are other signers with that surname. 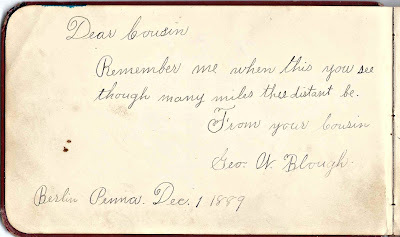 Clara Stokes, signed at Waterloo, Iowa, signed on 3 January 1888. 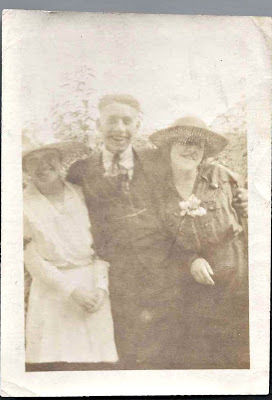 Whether the placement is significant or not, a snapshot of a man and two women was found tucked in this page and the facing page, next. The photograph is two images on. Ellen Zim*, signed at Stoyestown, Pennsylvania. Either her last name is short, or she ran out of room. Another Stoyestown, Pennsylvania signer was Lizzie Zimmerman, if that's a clue. Whether the placement is significant or not, there was a photograph tucked into this page and the facing page, the previous image. The photograph is the next image. 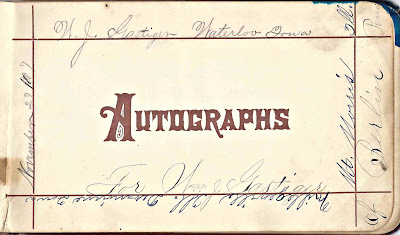 I didn't know there were autograph albums back then. They have lots of info in them. Would be great to have.